Belvedere is most famous for its more modern art – Klimt, Schiele and the like. But the Upper Palace is also home to a collection from a time when a Klimt painting might have started a small war. The bulk of Belvedere’s medieval collection is housed in the former stables, but the masterpieces are in Upper Belvedere: various examples of fine gothic religious art displayed across several rooms on the palace’s ground floor. The room preceding the collection is the palace’s former large summer drawing room, with wall and ceiling paintings that give the illusion you’re looking at three-dimensional architecture, rather than a flat painting. They’re mixed in nicely with real arches, so sometimes it’s hard to distinguish between what’s real and what’s illusion (story of my life). The central ceiling also features a celestial theme around the figures of Diana and Apollo. It’s quite beautiful and home to the Carlone Contemporary series of exhibitions, where every six months an invited artist presents a modern work designed to fit within this particular architectural context and imagery. Medieval altar panels and similar are not everybody’s cup of tea (or flagon of ale), but even the uncultured (i.e. me) can spot the difference between the masterpieces and the rest. And – equally important – the rooms themselves often offer something to marvel at in their own right. A selection of late-gothic panel paintings from the 15th and 16th century includes selected panels by the Master of the Schottenaltar from around 1470. 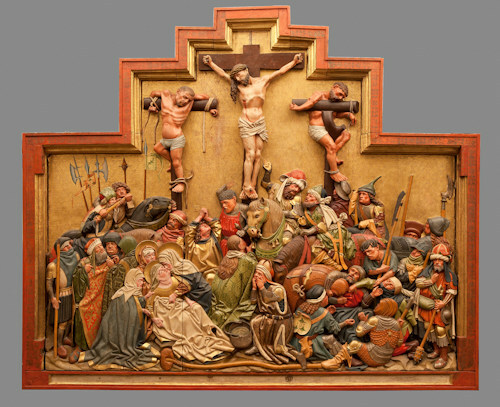 Most of these altar panels are in the Schottenstift Museum and are notable for portraying biblical scenes, but with contemporary backgrounds (including 15th century Vienna). So their value to historians is enormous. The same room also features panels by Michael Pacher from the late 1400s, which leap out at you because of the sudden jump in quality. Even the untrained eye sees how he uses depth and perspective to stand out from his peers. The final room in the medieval collection still features its original grotesque frescoes (Roman-style decorative scrollwork), dedicated to the deeds of Aeneas. It’s another classical reference of which Prince Eugene (Belvedere’s original owner) was so fond. The room hosts some original wooden and stone sculptures from the 1300s, 1400s and early 1500s. It only takes a few minutes to view the collection, and the works provide a nice contrast to the modern works displayed one floor up.